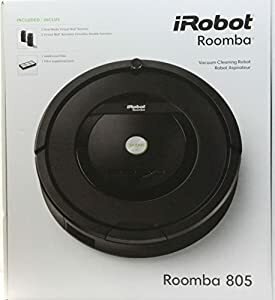 iRobot Roomba 805 Review & Comparison in April 2019! Have you ever wished to possess something (or someone) to do all the boring and tiresome housework for you? Behold, your prayers have been answered! Welcome Roomba 805 – an ultimate helper that will change your world forever. 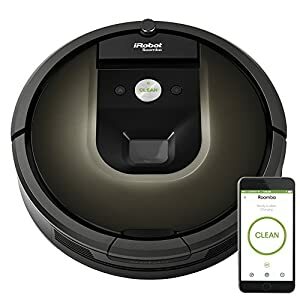 In this iRobot Roomba 805 review, I will walk you through the most exciting features of this glorious robovac and outline the differences between various models of the Roomba family. Roomba is a line of hoovering robots launched by the iRobot company in 2002, which revolutionized the very idea of the house cleaning routine. 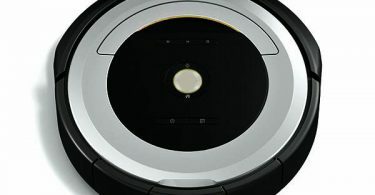 Roomba was one of the first successful and affordable robovacs that entered the market. Its ergonomic design and high efficiency stole the hearts of thousands of people in a matter of months. Not to mention that unlike other, upright and\or canister hoovers, this little hoover could work autonomously and was significantly quieter, compared to its bigger brothers. Just like any other standard vac, Roomba 805 has a Power button, a number of different brushes and a pair of wheels, but that’s about all the similarities it shares with a common vac. Let’s see what this little buddy is actually about. 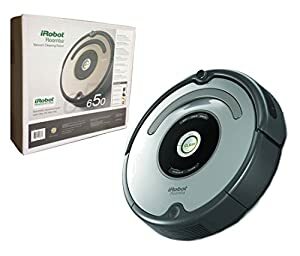 Roomba 805, just like most of the robovacs and all of the Roomba family models has a rounded shape, a pair of wheels and a side brush as well as two rolling extractors. It connects to a Docking station to recharge itself and let you know that the cycle has been completed. This vac works autonomously, scanning the configuration of your premises so that it can easily navigate through the rooms avoiding any obstacles. Roomba 805 has 5 buttons. The big CLEAN button will turn your robot on and off; the DOCK button will make it go to the docking station. Then, there are CLOCK and SCHEDULE buttons that you can use to set the time and frequency at your convenience. The last button is the SPOT button that will allow deeper and\or accurate cleaning of a particular area about 3 feet in diameter. Two virtual wall barriers with a set of batteries for each of them. 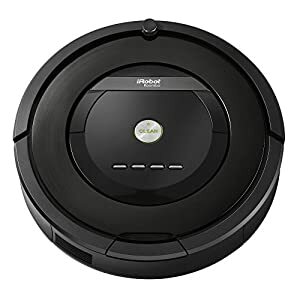 How to get Roomba started? So, basically, to get the hoover started, you just hit the central CLEAN button and let the magic begin. And at first, it really does feel like magic, because this little hoover looks like it lives its own life while doing its job. But before you start the vac, don’t forget to charge it properly. To do that, set up the Home\Docking station, put your Roomba on it and push CLEAN. You will see a small white battery indicator saying that it’s charging and is not ready to go off yet. When the indicator changes its color to green, press the CLEAN button again and your Roomba 805 will come to life. At first, Roomba’s movements may seem a bit chaotic and random, but don’t freak out – it will need some time to adjust to your flooring and map out the room. After a while, it will get used to the environment and move less oddly. The cleaning cycle lasts about an hour, and when the Roomba cleaning is done, it gets back to the Docking station and turns itself off. It can also tell you if the dust container is full – you will see the light indicating that the bin needs to be cleared out. Depending on how dirty is your floor, you may have to repeat it a couple of times. Make sure there are no power cords in the place that your small helper can reach. And be sure, it will reach anywhere it can due to its low-profile design. Also, try to put away any fragile objects from both the floor and the tables – before the vac gets used to the premises it is likely to bump into things, so be cautious. Plus, make sure no water is spilled anywhere since those are the hoovers, not the mop. The robot comes with two devices that can be used in two modes. First, when the switch is UP, it creates an invisible 10 ft barrier that the robot recognizes and doesn’t cross. When the switch is DOWN, the device creates a kind of a round screen of about 24 inches, completely invisible as well, around the object you don’t want the hoover to bump in or clean around. The device is safe for pets and humans. iRobot Roomba 880 is a newer model compared to Roomba 805. It can be operated remotely and is a bit smaller (13.9″ x 13.9″ x 3.6″). It runs on the special iRobot batteries, unlike the 805 which uses a LIB. Both units have a circular shape and are colored black, but the 880 looks slightly sleeker and modern. Also, the 880’s buttons are silver, which makes them easier to find on a hoover’s top. As for the noisiness, both devices produce less noise comparing to the bigger vacs. Wanna know about the most compelling difference making Roomba 650 special? Unlike the 805 model, is possesses the brushes. 805 has two similar debris extractors, but this one has only one extractor and the brush with long bristles. But just like the 805 item, Roomba 650 has sensors that help it avoid the stairs and prevents it from falling. You can as well set this little guy so that it follows a schedule. However, the 650 option has a bit more buttons (8 to be precise), so figuring out how the thing works may take a bit of time. Also, the 650 moves in even more chaotic manner and bumps into the objects even more violently. Among the cool features that most of the vacs lack, is a pullout handle that allows carrying it easily around the house. Altogether, both hoovers do a wondrous job, although Roomba 805 may handle the pets’ hair a bit better. It’s time for some really cool stuff! This Roomba 890 is one of the newest models and the first Wi-Fi-compatible house care among the iRobot family. 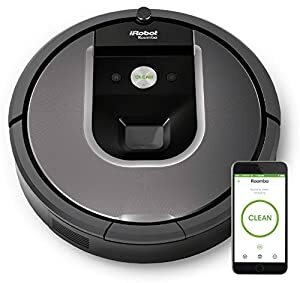 Unlike Roomba 805, this one can be operated through the app that is available and free both for the owners of Android and iOS. When the robot’s done performing its task or if anything goes wrong during its operation, you will receive the relevant notification. It also features an improved filter and a somewhat different set of extractors. However, the robot can sometimes behave oddly, not being able to find the Docking station even if it is just right beside it. At times, this may lead to the vac being stuck in one room and result in it running out of charge. The robot comes with one virtual wall barrier. I have just said that Roomba 890 was one of the first iRobots that could connect to Wi-Fi. And the very first one in this regard was Roomba 690. Compared to the 805’s design, the 690 model looks a bit more stylish and has only three buttons: CLEAN, HOME\DOCK, as well as SPOT. And in contrast with 805, the buttons of this one don’t read anything and just show cute little icons. The dustbin in 690 is just like in the 650 option, but it differs from that of 805. The brushes to resemble those of the 650 item Altogether, this Roomba 690 is an upgraded version of 650. 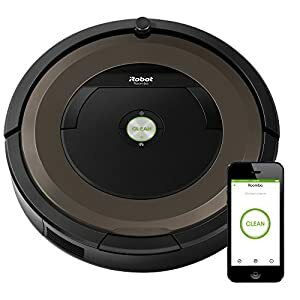 It is a bit more intelligent and doesn’t have trouble finding the Docking station, but neither has Roomba 805. Roomba 980 is the latest of all existent Roomba models. Just like two previous units, this one is Wi-Fi-compatible and can be controlled via your phone. You can also operate the vac through the virtual assistants like Amazon Alexa or Google Assistant. Roomba 980 also features a carpet recognition technology that makes the unit increase the power for more thorough cleansing. It also features a brand-new mapping system that allows it to find its way around your home faster and more efficiently. It can also send you the reports letting you know how the house care routine is going. What is more, this model can run up to 2 hours without a recharge and, on overall, the suction power is 10 times stronger than the one of the elder models. 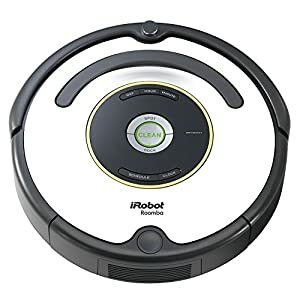 This Roomba 960 is the predecessor of the 980 model, so there are not so many differences between those 2, should we compare it to Roomba 805. Just like Roomba 980, this hoover is Wi-Fi-compatible and can be operated via the phone app and\or the virtual assistant. The only feature that the 960 model lacks is the carpet recognition technology, therefore, whenever the vac detects a carpet, it keeps working the same way. Also, its operation time is just 75 minutes, which is almost twice as low as the 980 can consume, but still 15 minutes longer than the 805 can. The representatives of 900 series, in general, have a more sophisticated look and has only 3 buttons: CLEAN, HOME\DOCK and SPOT. From the technical perspective, the 860 and the 805 options are very alike, with the first noticeable difference being their color: Roomba 805 is totally black, and Roomba 860 is silver with only a top panel being black. Both of them have 5 buttons, and the set is identical. The next thing is the filter. Roomba 860 features aHEPA filter, which is good against the smallest dust particles. Both models are said to be efficient in eliminating pets’ fur, but the 860 model, being a bit newer and, therefore, advanced and powerful may handle this issue even better. Also, the newest model is supplied with the improved iAdapt technology, which means less preparation before you decide to run the hoover. 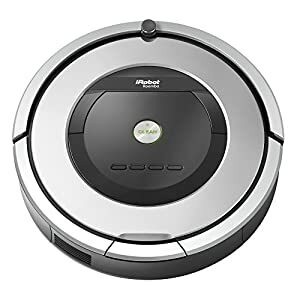 This Roomba 665 is a part of the iRobot’s Pet Series, meaning that it has been specifically designed to efficiently collect pets’ hair. Like other representatives of 600 series, this buddy has a nice top handle that allows carrying it easily around the house. Although this unit is still moving in random patterns and may sometimes miss a spot or two, it does a pretty great job detecting and picking up both smaller and bigger particles. In terms of the design, this 665 model looks a lot like the 650 option but comes in grey and black colors. Mind that this robot is not Wi-Fi compatible and can be a bit loud. What you see first when you look at Neato is its unusual shape – it’s not perfectly round, which allows it to get into the corners of any room. At the same time, Neato lacks a side brush. Roomba’s charging station is a lot smaller, but, on the average, that does not make any difference. They both work fine. Roomba is quieter, and Neato sounds almost like a full-sized vac which can be irritating, but, at the same time, Neato is more powerful and handles the carpets significantly better. Also, there is a difference in the cleaning algorithm – whileiRobots move randomly, Neato maps out the perimeter first and methodologically goes through the whole room, leaving no spot uncleaned. 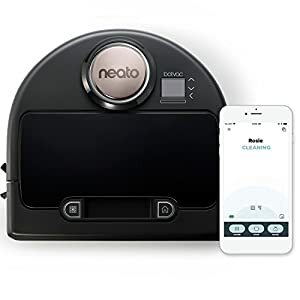 The final difference is that Roomba 805 can be tamed with the help of Virtual Wall Barriers (devices), and Neato uses magnetic strips that are to be put on the floor in order to prevent the vac from entering the unwanted areas. Also, it has no problem crossing the thresholds that are up to 20 mm (0.7″), which means the thick carpets are no trouble for it either. iClebo has 4 types of sensors that allow it to map, navigate the environment with an advanced efficiency. Another great feature this robovac has is that Roomba 805 does not have a mop. 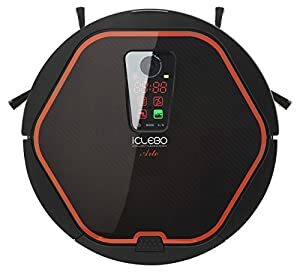 You have to be really careful not to put your Roomba on the wet surfaces or over the spilled liquids, but with iClebo, you will not have to fuss about the pre-cleaning preps that much. When the session is over, this guy will also automatically return to the Docking station and\or when it needs a recharge. The final thing about iClebo is that it does a really amazing job thoroughly tidying your floors – first, it studies the room and then covers the whole area line by line like a real expert. Now that you’ve read about all these beautiful smart robots, you can make up your mind whether you need one at all, and which exactly, since there is a whole universe of robovacs, each with its own unique features. Some of them are all-purpose robots that will do well on any flooring. Some do better on carpets; others perform best on hard floors. Some were designed specifically to pick up pets’ hair; others can do the mopping as well. Depending on what you are looking for in your new house robot, now you can pick up your own personal helper. 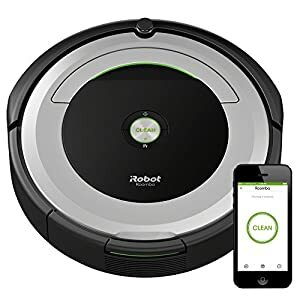 Even though Roomba 805 lacks many of the useful specs that newer models have, it is still a decent and affordable vac that can efficiently handle most of the surfaces and spare you a lot of time and effort during your house care routine. Just hit the button and let the vac do all the boring and tiresome job for you. It may move a bit chaotically and act as if it’s a bit confusing, but once you’ve tried it, you will not want to let it go and will love its cute buzz which will become the synonym of cleanliness in your house. Hope you’ve enjoyed this iRobot Roomba 805 review and found it useful. Feel free to let me know what you think and leave a comment in the box below. Remember, life is like a rollercoaster, and every once in a while everyone needs a bit of Roomba.